I don’t typically make New Year’s resolutions, because I don’t typically keep them. But I am resolving to make 2014 the best year yet – and that means taking a little time to keep balances, focused and healthy. realistic goals that set you up for mini-successes throughout the year. set should be goals over which you have direct control. For example, set mini goals of how many servings of fruit you eat each day or how many minutes you exercise. For some people keeping a food journal can be tedious. Instead of writing down what you eat, snap a quick photo of it on your phone. Visual representation of what you’ve eaten or had to drink will hold you accountable during the day. At the end of the day you can look back and remember what you had to eat and when you ate it. vegetable like green beans and a whole grain, like brown rice. Breakfast gives you the energy you need to start your day off right. Try to incorporate at least three different food groups at breakfast every day, like whole grains, fruit, and low-fat dairy. A yogurt parfait is a great example that contains all three! carbohydrates and protein will help keep you full longer and stabilize blood sugars. whole grain crackers, hummus and carrots, or dried fruit and almonds. Too much sodium in the diet has been linked to high blood pressure, which is a major risk factor for heart disease. Limit your daily intake of sodium to less than 2,300 mg and instead increase your intake of herbs and spices to boost the flavor of your plate. Get creative with garlic powder, cumin, ginger, paprika and more. weights. For an hour long television show, you’ll be moving about 17 minutes. Stay hydrated. Even mild dehydration can leave you tired and lacking energy for daily tasks. Limit your liquid calories like soda, fruit drinks, iced teas, coffee drinks, etc. Try carrying a reusable water bottle with you wherever you go and drink from it throughout the day. choices. Be sure to include a lean protein, healthy fat, and whole grains, in addition to your fruits and vegetables. When dining out, go online ahead of time to look at nutrition information to determine which meal option would be the healthiest. 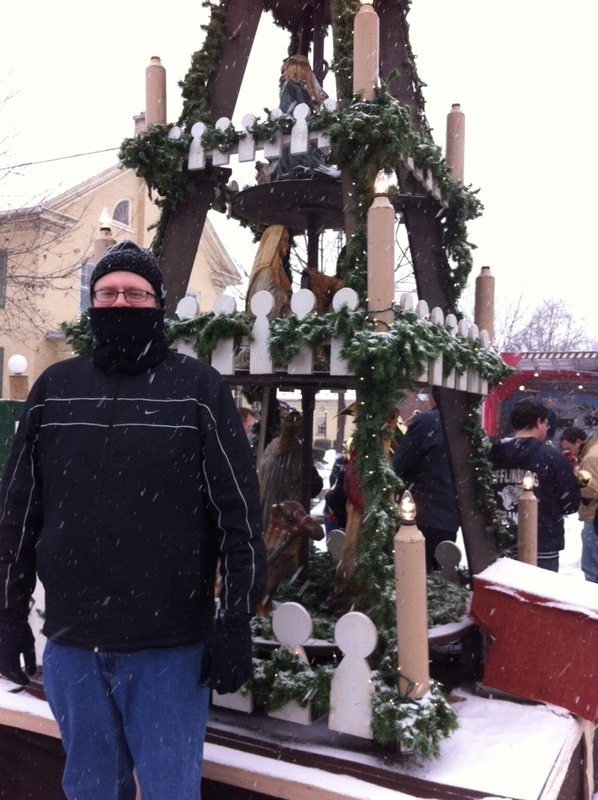 Snow ruined some of my weekend plans – a bus trip to New York City – but my fiance and I decided to brave the snow and do something fun anyway and we headed to Christkindl Market in Mifflinburg. I had never been and wanted to see what it was like. We headed out early to avoid the worst of the storm – but it was still pretty cold. The moving Christmas tree was really cool. I don’t know too much about German traditions so it was really cool to see something new and different. The highlight of the whole thing was the food. It was truly a food-centric fair, with enough schnitzel to shake a stick at. But it was delicioussss. And very affordable. 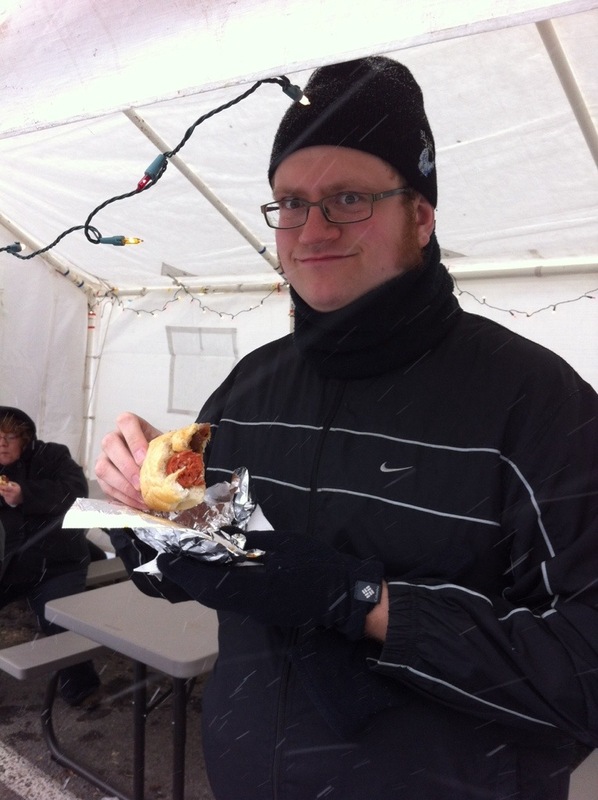 A lady in front of us at the Brat House said she would come out in 10 inches of snow to get their sandwiches and Mike tried one. He loved it. This is definitely one festival I’d go to again. Do you go to Christkindl market? What’s your favorite part? New bakery in Milton – so yummy! Friday I went to the grand opening celebration for a new bakery in Milton – and I’m now very concerned because everything looked, smelled and – from the samples I had – tasted amazing. This means I’m going to have a problem when I’m out covering Milton not stopping once the bakery is open full time. Right now, it’s just on weekends on South Front Street. 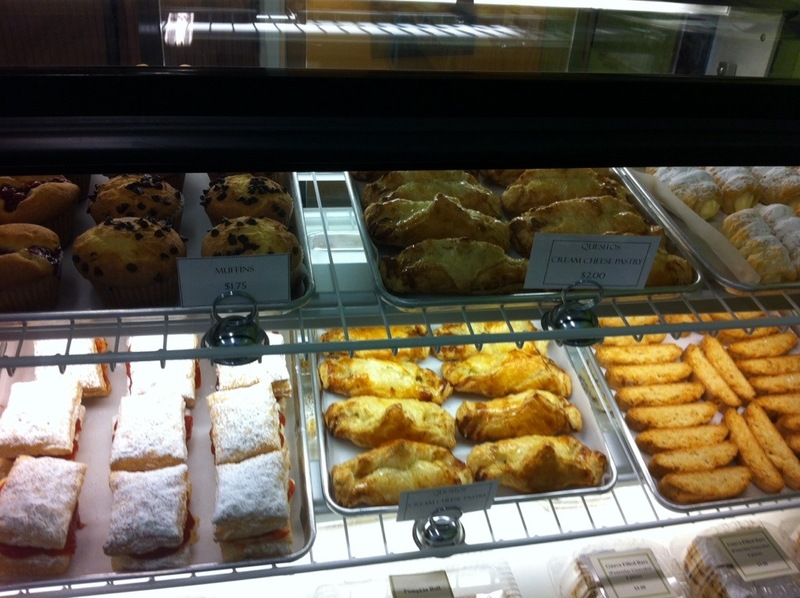 It’s Mirella’s Fine Cakes and Pastries. 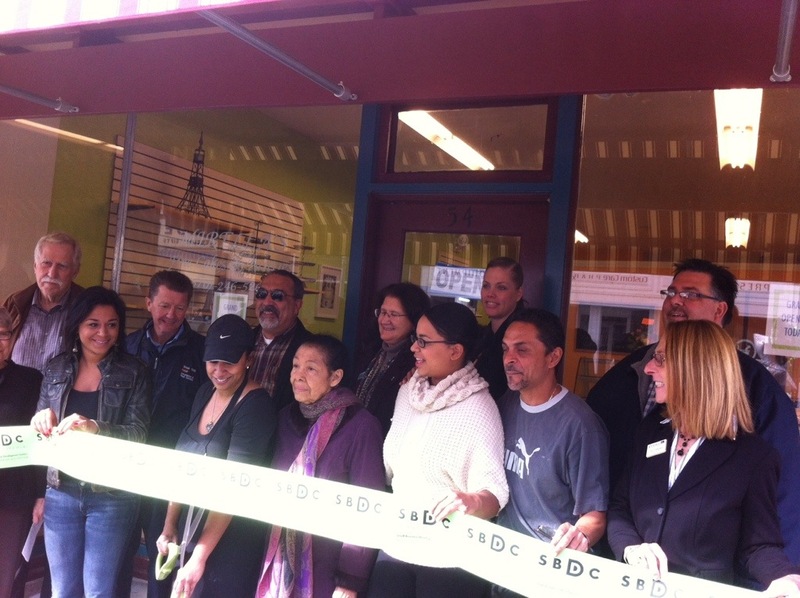 The story is also a great one, with owner Mirella Deleon continuing to pursue her dreams of owning her own bakery for 20 years. Her family was on board for the opening celebration Friday, as well as those who helped her with her transition to downtown Milton. Mirella even teased her mom about pushing her to take baking classes when she first got interested in baking and pastries. I’m hoping Mirella has plenty of success and lots of time to celebrate here in the Valley! 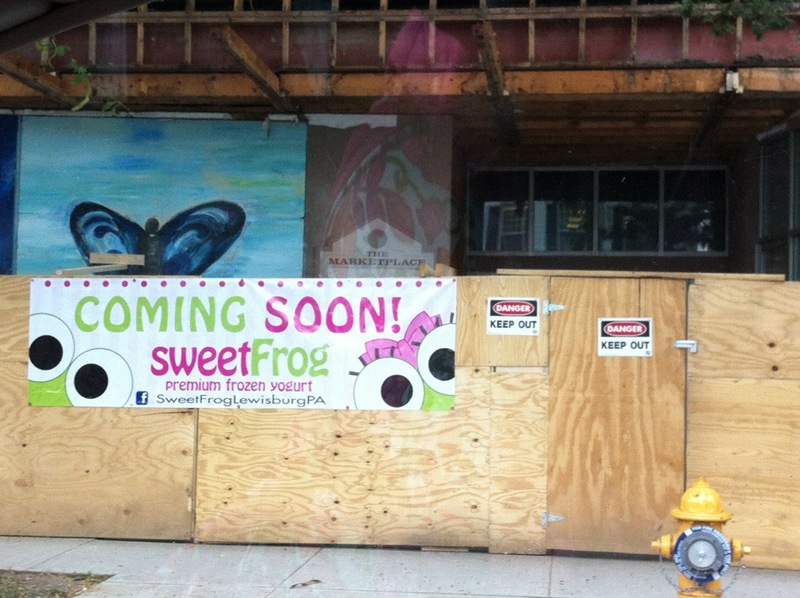 Sweet Frog is coming to Lewisburg! Yessss! Let me explain, Sweet Frog is part of the latest dessert trend, the yogurt bar where you top your yogurt with all the toppings you want and pay by weight. The toppings include just about anything you could want to put on yogurt, from gummies to candy to sauces. My fiancé and I first tried one in Arizona and now we have my whole family hooked. Now, I normally don’t get too hooked on trends, but I couldn’t resist this one, and am SO exited to see it hit the Valley. One yogurt bar opened in Bloomsburg recently and now with this one, I’m hoping yogurt bars are here to stay! Here’s to hoping Danville gets one next! 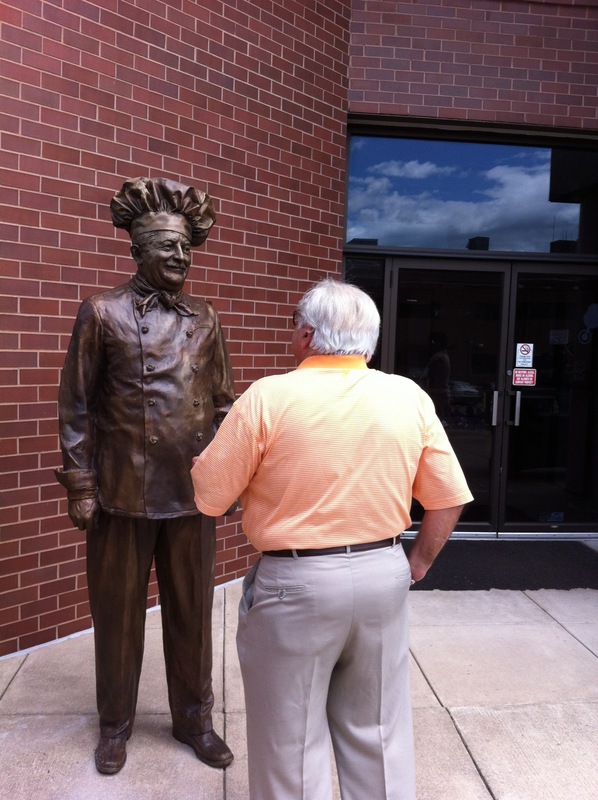 Yesterday at ConAgra a beautiful new statue of legendary Hector Boiardi was unveiled at ConAgra in Milton (the company that now makes the Chef Boyardee products). \While the statue was a great tribute to the man, the way the statue was unveiled was simply – well – delicious. The statue was hidden under a giant can of Spaghetti and Meatballs on wheels, hiding the statue inside the very product that made him famous. 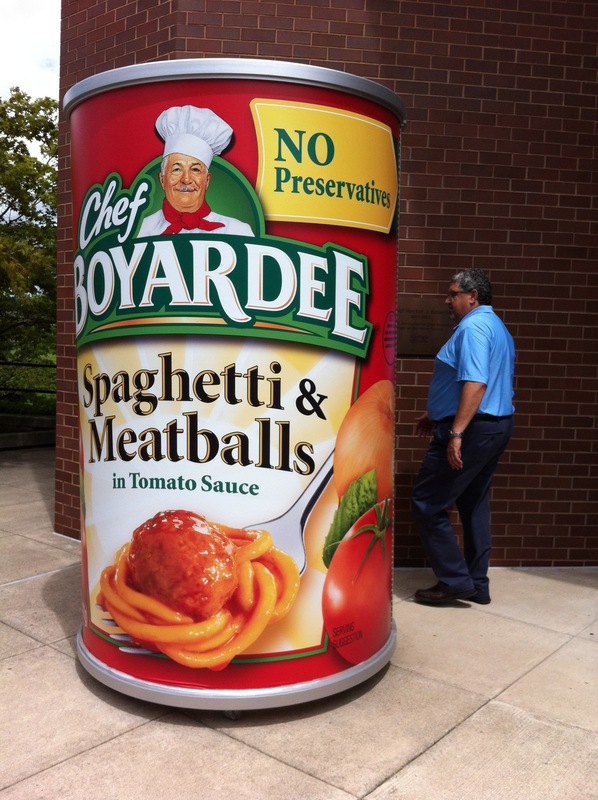 The can was wheeled away to reveal the man underneath, and in a touching tribute, his nephew, Paul Boiardi was the first person to walk up and examine the statue, looking up at a man he said was “very proud” of his products and the way Milton embraced him. Everyone at the event was just thrilled to see the larger-than-lifesized Chef. It’s definitely an event I won’t forget. Yesterday was an important day in the Wislock family – My dad and I celebrated our birthdays during our annual double birthday celebration! Whoooo! 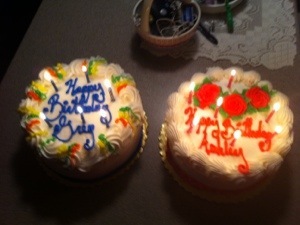 We each get our own cake, since my father is a little bit of a Grumpy Gus and wants his own cake. 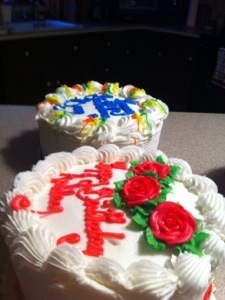 A mistake only made once, on my first birthday. But it was a little disappointing that my sister, scheduled to have a baby any day now, did not give birth to my little niece yesterday (booo!). But I figure as long as she has it this week, we can count is as a triple birthday extravaganza, right?! 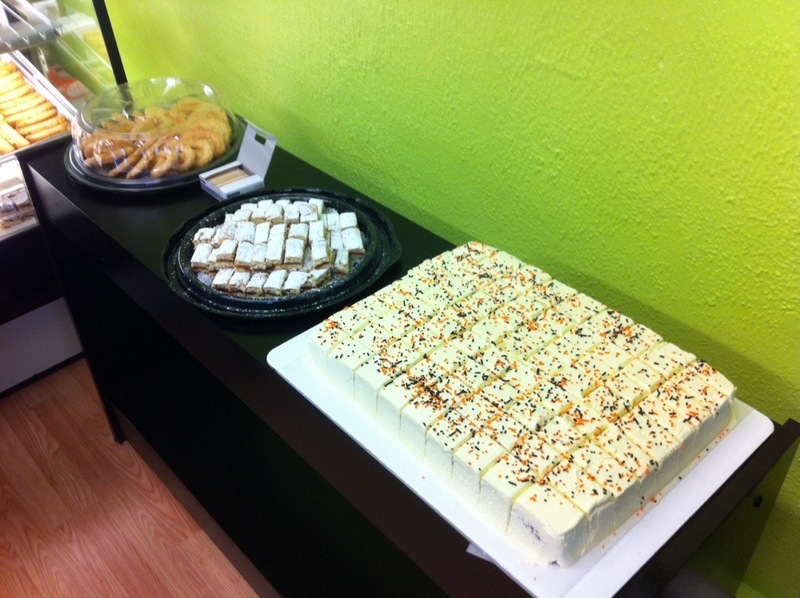 So if you’re in the mood for cake, swing by Danville, we’ve got multiple! And happy birthday to everyone celebrating this week, definitely the best week to come into the world! Yesterday, I attended a presentation about nutrition for kids. But I also learned a lot about what is in the stuff I drink. 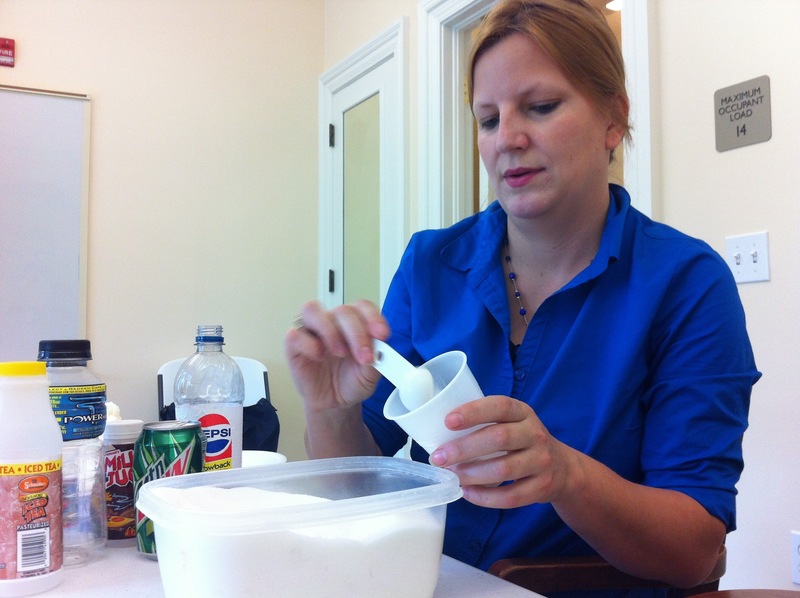 Instructor Cynthia Clayton had participants measure out sugars in a variety of drinks to see how that all adds up. It was really shocking. It’s definitely interesting to see how much pure sugar is in your drink. By cutting out a two soda a day habit, you can lose 31 pounds in one year. Bodies have to work to digest sodas and swweetened drinks, whereas water just hydrates. Therefore, drinking a soda when you’re hot will create more heat as your body works to digest it. 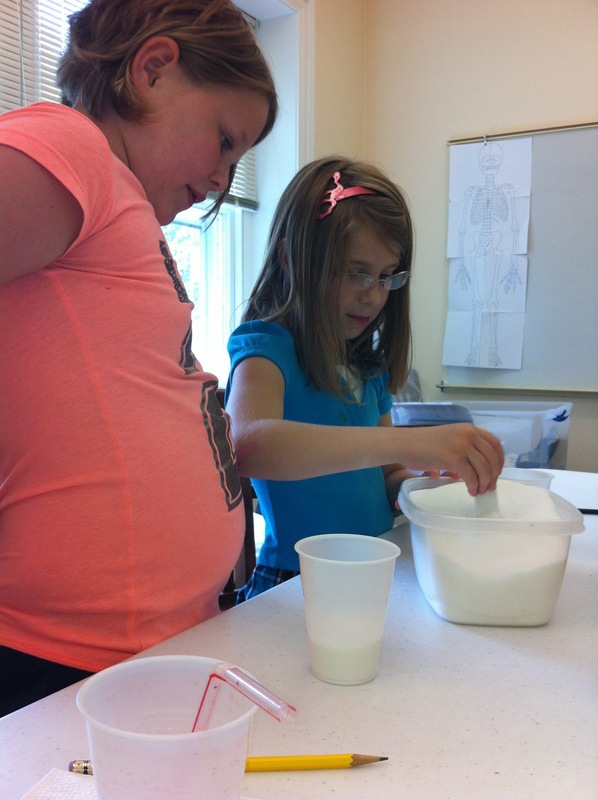 Dividing the number of grams of sugar in a drink by four gives you the number of teaspoons of sugar in the drink. It’s a lot to think about. I know I am definitely looking at my drink choices today.